In 2007 Costa Land Company acquired a prime location at the corner of 6th Ave and 11th in Greenwich Village, just blocks away from NYU. This high traffic location includes retail space that is the home to E.A.K. Ramen, a brand new Japanese restaurant serving IEKEI style Ramen. Operating over 400 locations throughout Japan as Machida Shoten, E.A.K. 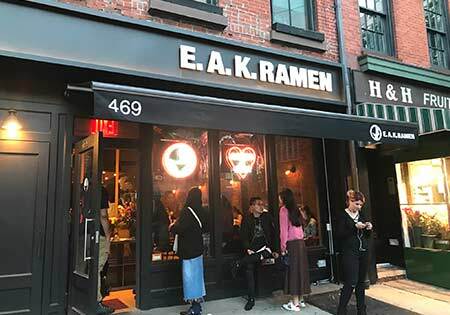 Ramen opened its first NYC location on the heels of a triumphant opening in Los Angeles. Within its first month of opening, E.A.K. Ramen garnered rave reviews from critics and locals alike. The building also features some of the most incredible luxury apartments in all of New York City. Old world charm, as seen in the antique Tiffany glass detailing, is paired with beautifully modern kitchens and baths, all of which were designed and installed by Smallbone of Devizes. The outside private terrace, a luxury in the city, enhances the apartments' chic charm.